It is mandatory for all vehicles to have registration and number plates. It helps authority in case of an accident or to crack down crime. But there are several vehicles in Delhi that do not have legal number plates. It is rather difficult for the cops to identify these automobiles. Thus, the Delhi government came up with the HSRN or High Security Registration Number Plate scheme. These new plates will make it easy for cops to identify registered and unregistered vehicles. Access to information – This step will assist Delhi government and transportation department to keep updated information about the registered cars. Necessary fee – The residents of Delhi will have to pay Rs. 67 to attain new number plates for two wheelers. The fee for number plates of four wheelers will be Rs. 213. Penalty amount – If car owners don’t get their new high tech car number plates, the transport authority will put a fine on them. Such car owners will be charged as much as Rs. 500 penalty for non-compliance. Imprisonment tenure – In case car owners don’t pay heed to the warnings, and don’t apply for this new plate, they can face the chances of imprisonment. This imprisonment tenure will be of three months. Features of the number plate – These High Security Registration Number Plates are made of aluminum. Chassis code, 10-digit ID and the engine number will be highlighted on these plates. These plates are robust and water-resistant as well. Online payment facility – For ease of fee payment, applying candidates can make use of online payment gateways to make timely and quick fee payment. Fuel identification – The automobile department has also mentioned that car owners will also receive special stickers. These stickers will indicate the sort of fuel the car uses. These come in different colors to indicate the different petroleum-run cars from diesel-powered vehicles. HSRN plate fitting – The fitting of the High Security Registration Number Plates will be done without charging any additional money from the car owners. RTO has already established 13 fitting centers. These RTO centers will check the papers, and fix the new plates at the back of the vehicles. As the scheme is associated with the automobiles, the Delhi Transport Department will take necessary steps to ensure that the scheme is properly implemented. During the first announcement, the Delhi authority mentioned that all registrations will commence from October 2018. But that has now been postponed. Only online registration process has been kept. The authority believes that online registration will speed up the entire process. The Transport Department will launch an authorized portal. One can get their hands on the online application form via marked links. After the applicants fill in all fields, mentioned in the digitized application form, they must proceed to make payments via the online process. Successful application and payment submission will trigger the site to generate a date. Automobile owners must reach the RTO office with car papers on the specified date. It will be the responsibility of the RTO officers to check the papers, and fit the High Security Registration Number Plate at the back of the vehicle. Residential proof – This scheme will be applicable to those applicants, who live within the borders of Delhi. Thus, submission of residential certificate is a must during the fitting of the HSRN plates. Car registration papers – All documents, related to the actual registration of the vehicle must be produced at the RTO office. Insurance papers – The owner must bring all pertinent papers, which highlight that the car has been insured. Chassis print – The owner must also bring the original Chassis code papers. ID proof of owner – It is mandatory for the car owner to submit his/her personal identification certificates. The voter card, PAN card, or Aadhar cards will be accepted by the authority. Sales certification – The applicant must also bring the sales documents. The car dealer will be able to provide these papers to the car buyer. What is high security number plate? 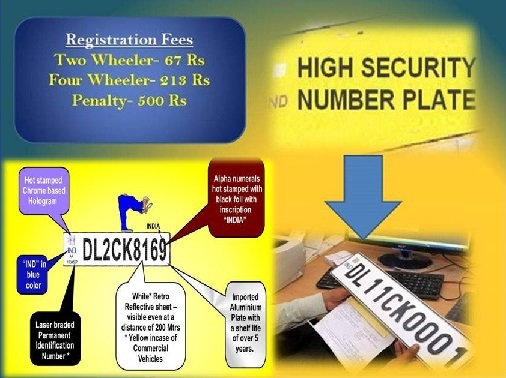 From now on, the High Security Registration Number Plates will be offered to all registered vehicles in Delhi. These number plates are a perfect combination of modern technology and durability. These number plates will highlight the details of the automobiles and the owners. Due to electronic tags, placed on these number plates, authorities will be able to attain data from any part of the nation. How to get high security number plate? Once the site generates an interview date, the automobile owners must reach the RTO office with car papers on that specified date. It will be the responsibility of the RTO officers to check the papers, and fit the High Security Registration Number Plate at the back of the vehicle. The RTO offices will be assigned as per the residential areas of the applicant. There will be a hot stamped hologram at the top left corner of the plate. This hologram is chrome based. Below this, one will find the permanent registration number. The registration number will be laser barded. As for the registration plate, it will be made of high quality aluminum. These plates have been tested to remain intact for at least five years. All alpha numerals will be placed on the base plate that will have a coat of retro reflective coating. The color of this coating will be white for private vehicles, and yellow for commercial automobiles. The special coating will make the numbers visible from a distance of 200 meters. If any person requires information about the new and modern vehicle number plate scheme, he/she can call on the helpline numbers. Each has area has been assigned to a particular official. To get these details, one has to click on the link http://www.hsrpdelhi.com/status/ContactScreen.aspx. The Delhi government can identify the unregistered cars by marking all legal cars with this HSRN plates. Once this is done, it will be all the more straightforward for police and transport officials to pinpoint unregistered vehicles. What is required to check the status online? In the first place make sure that you have already applied for the high-security number plates for your vehicle. After applying, vehicle registration number is required in order to log in to your account and check the status. How to check the status online? You have to visit the official website of high-security number plate check. Following this, you will get the option to enter the vehicle number. After entering the correct vehicle number, you have to click on the search button to access the details of the status. In case you have not yet applied for the high-security number plate or there are certain issues pertaining to the application submitted, you will not be able to check the online status. If the application has been submitted correctly, it will be shown whether your order is under processing or not. How does the status checking facility help? The high-security number plate status check has become easier than earlier. Therefore, the status checking facility has become easy for the ones who are living in Delhi as the system has been declared mandatory to have high-security number plates for your vehicles. You need not visit the RTO office and you can easily check the status from the comfort of your home or desk easily by following some steps. Good scheme. What is the provision for the vehicles going to Delhi from the neighbouring states. more new label fitting centers are required so that no one should wait. It is to be done in two phases. 1st registration and issjue of the plates. 2nd physical verification and fixing. There is chance that one shall misuse others number and deceive the authority. In this case the punishment should be severe.